Manchester City manager Manuel Pellegrini says the club sold striker Alvaro Negredo because of their Financial Fair Play (FFP) punishment. City had to reduce their Champions League squad from 25 to 21 as a sanction for breaching FFP rules. 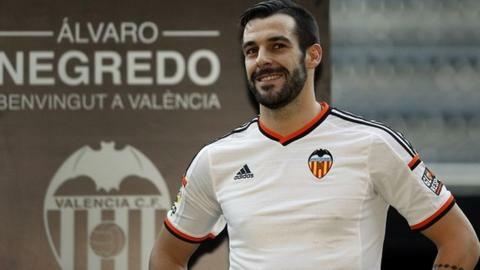 Negredo joined Valencia on transfer deadline day in a loan deal which will be made permanent next summer despite impressing in his first season at City. Pellegrini said: "It all starts from the restrictions about the players." As well as a reduced squad, the Premier League champions were also fined £49m by Uefa and forced to limit their net summer spending to £49m after failing to comply with FFP last season. What are Financial Fair Play Rules? Uefa made its first FFP ruling based on club accounts from the 2011-12 and 2012-13 seasons. Under this monitoring period, total losses of £37m (€45m) were permitted as long as clubs had owners who could cover such amounts. City posted combined losses of almost £149m - £97m in 2012 and £51.6m in 2013. The decision to sell the 29-year-old came as a surprise to many as he had impressed since his £20m signing from Sevilla last year, scoring 23 goals in all competitions in his debut season. "The decision for Alvaro Negredo to go was for two very important reasons," added Pellegrini. "The first was that we have the restriction for the number of the players we can use in the Champions League. "We had one player more, and we could not use Alvaro, who was injured, so he was the player who was not going to be on the list. "For him, it was very important because he wanted to go back to Spain, so I thought it was the best decision for the club."